Trust me when I say, I used to run away from vegetables till a few years back. I was, (and still am) an ardent meat lover. However, now I love to cook and eat all kinds of vegetables. Thanks to my father-in-law who is an amazing cook (his mutton korma is to die for); I learnt how delicious and diverse vegetables can be…so many vegetables out there and so many ways to cook them. When he was staying with us, every meal constituted of atleast one vegetable. And that’s how I started eating most veggies… I also learnt to cook many vegetables from him and over time, I have adapted them in my own way. This is one of the vegetarian dishes that I learnt from him. It is one of those simple, quick sides that never let you down. Every time I make this for guests, it is guaranteed to be a hit. Yesterday I made this as I had a bit of Bhindi/Okra in my refrigerator and this is such a yummy way to make use of a little leftover Okra. I have explained method to select good Okras here..
My father-in-law originally uses Bitter-gourd / Karela in this recipe. It tastes brilliant as the bitter-gourd is deep fried and mixed with yoghurt; it loses most of its bitter taste. 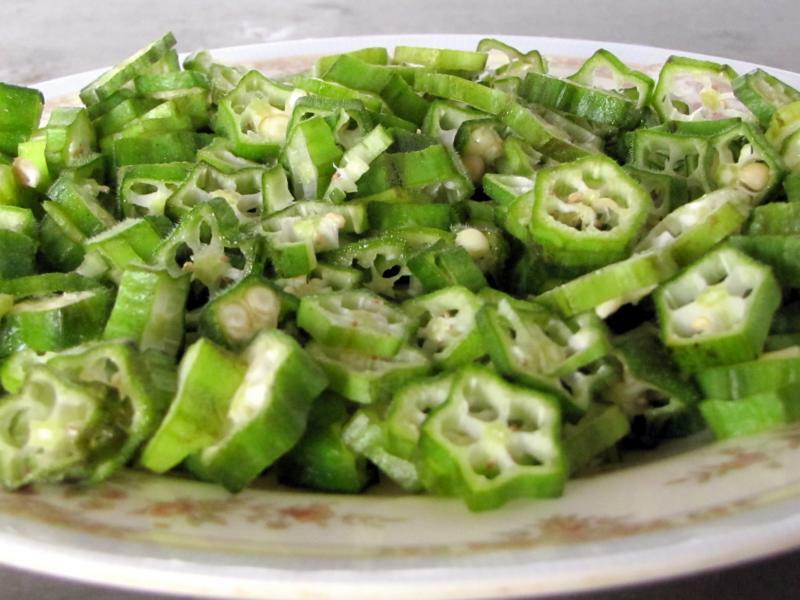 When I first substituted Bhindi / Okra in this recipe, I was thrilled with the result. 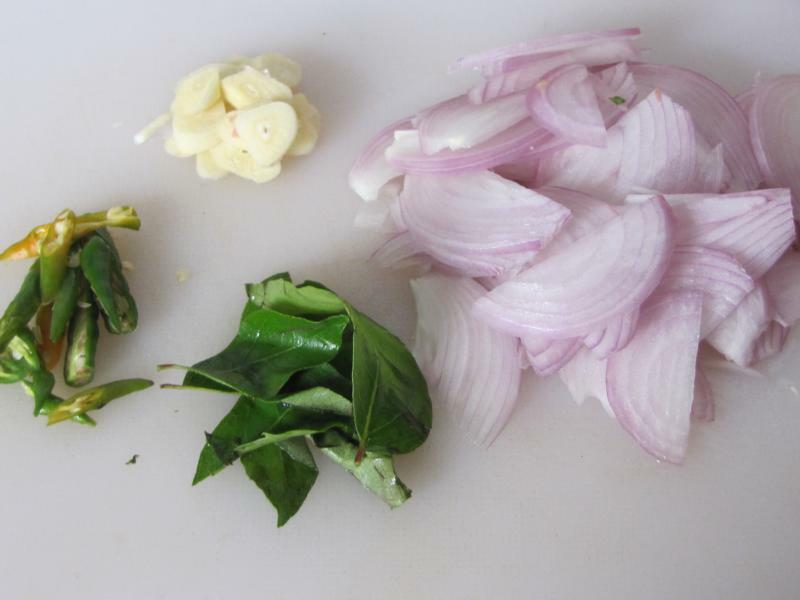 You need some onion, garlic, curry leaves, green chilies, and whole red chili. All the ingredients are deep fried till crisp. The fried ingredients are then added to yoghurt. This goes well with just about any combination of Indian food. Or simply serve with hot steamed rice and enjoy! Heat oil in a pan, fry the okra till crisp and transfer into a bowl. Do not close it with a lid or crowd them as it will turn soggy. In the same pan, fry the onion, garlic, green chili, curry leaves and whole red chili till crisp. Remove from heat and mix alongwith the okra. Add salt to taste. 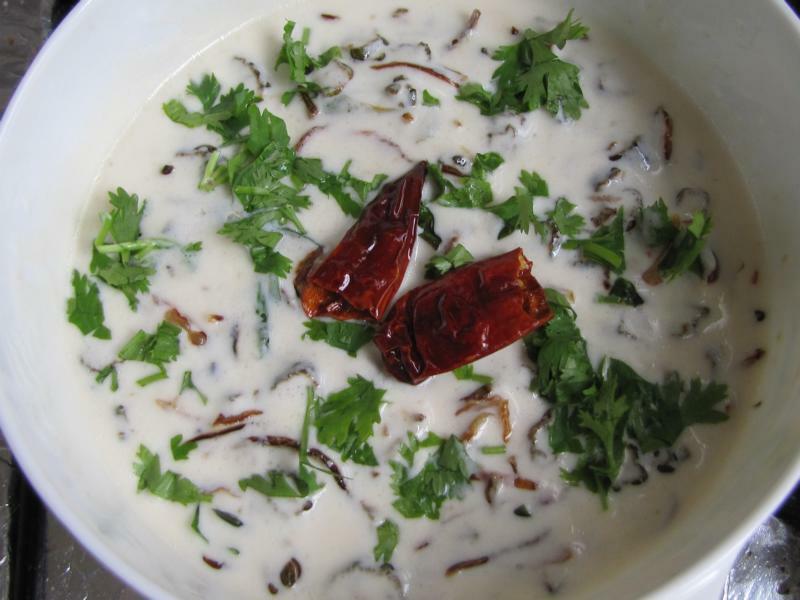 Serve with steamed rice and pickle for a yummy uncomplicated meal! NOTE – If you prefer to use Bitter-Gourd / Karela, follow same method. 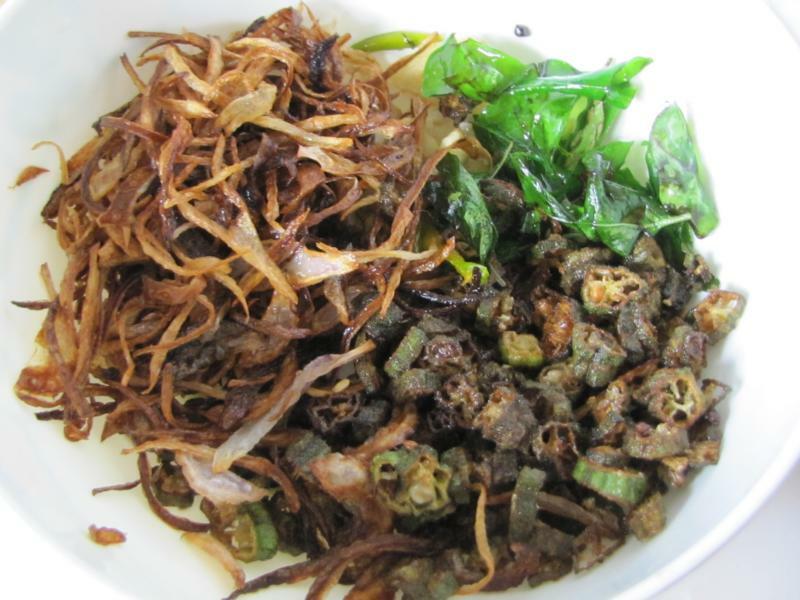 Substitute Okras with Bitter-gourd (finely chopped into round pieces) and deep fried.